This week’s Nutrition Matters is the first in a two-part series focusing upon the regenerative power of sleep, a longevity essential that so many of us struggle with. Research has confirmed that we really do need our eight hours of shut-eye each night, and every hour we miss can translate to a disproportionate reduction in our overall lifespan. We build hormones as we sleep, so there is no surprise that insomniacs can suffer the ravages of endocrine disruption. We cleanse and renew as we dream and we de-stress in the absence of the 50,000 thoughts that clutter and confuse our waking hours. Some say there is nothing more important than sleep to stay happy and healthy, and they may well be right. Most of the regeneration happens between 10 pm and 2 am, so if you can just ensure sleep during this critical period you will minimise the multiple negatives associated with insomnia. Herbal preparations like valerian, passionflower and hops are notorious for the fact that they last just four hours. The secret here is to turn this limitation into an asset by making those four hours the ones that count. It takes 40 minutes for herbals to kick in, so take your harmless herbs at 9.20 pm every evening, so you will be sleepy by 10 pm.You are then able to rebuild your body during that all-important, 4-hour slot. There have been a number of famous artists, scientists and celebrities who have claimed that they can exist and perform well with just 4 hours of sleep a night. If you look a little deeper, you typically discover that they chose these critical hours. There are some critical nutrients needed for sleep, and unfortunately they are missing in many of us. Two of these sleep essentials are magnesium and vitamin B6. These nutrients are both depleted by stress and, sadly, it is often stress and anxiety that can keep those tired eyes wide open during the small hours. During my global travels, I always ask my audiences a revealing question. I ask, "How many of you can honestly say that you do not suffer from anxiety on a regular basis that you would rather not feel. How many of you are stress-free?" Amongst the thousands of audience members in 33 countries last year, there was an average of one hand that rose for every 50 people. If we recognise that we are here to experience as much peace and happiness as possible within our very short lives, then we need to realise that anxiety is the opposite of peace. In this context, we are really a failed society. We have embraced a materialist, consumer model involving extraction on all levels, but we can't even justify our excesses by claiming that at least this model has delivered the key to our peace and happiness. I had better stop raving and get back on track! The irony here is that magnesium and B6 are the nutrients that make us relaxed, but they are also the nutrients that are sucked up when we are stressed. The more we stress, the more we deplete, and the more we stress. If we do not intervene with some replacements, then the end result of this downward spiral can be burnout (adrenal collapse), heart attack, or stroke. Most people in our strung-out society are deficient in magnesium and B6 (around 80%). The best magnesium corrective is a combination of oral magnesium supplementation combined with transdermal magnesium. MagSorb™ from NTS Health is Australia's largest selling transdermal magnesium. It is sprayed onto the skin, where the concentrated magnesium is absorbed ten times more efficiently than through the gut lining. Vitamin B6 at 100 mg should be combined with your oral magnesium supplement for best effect. However, there is another important issue when supplementing any B vitamin. For best results, you should always include a separate B group complex with the 100 mg of B6, because the B group vitamins all work together to maximise the uptake and utilisation of each other. I do not suggest that we silence our brain with a chemical bashing (sleeping pills or alcohol). Instead, it can be productive to trick the brain into silence or simply bore it to sleep. Here's how that might work: The Emotional Freedom Technique (EFT) is a highly effective brain training technique you can check out on YouTube. It has proven very effective for insomnia, amongst many other problems. 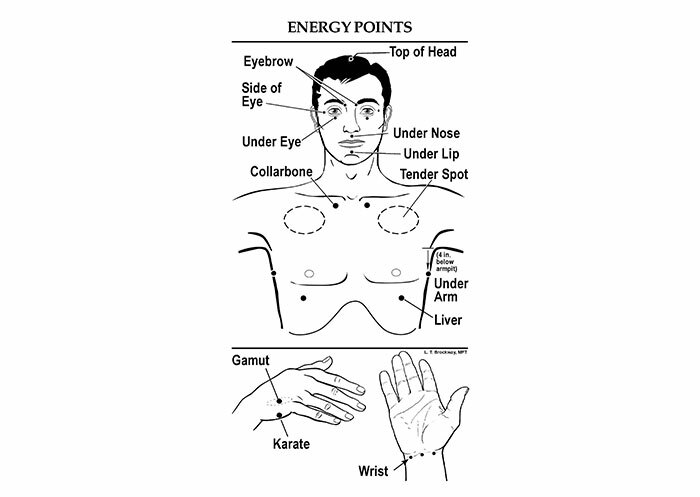 EFT involves tapping on key acupuncture points that effectively direct your verbal message straight through to the brain. That verbal message must include a statement of intent and a positive affirmation. For example, if you were trying to conquer your insomnia, you would repeat the following statement several times, while tapping through the key points (see diagram below) – "Even though I am suffering from insomnia, I love and deeply respect myself". This is an example of a dynamic new science called psychoneuroimmunology, which focuses upon the effect of our emotions upon our physical health. In this case, we are triggering our brain to message our cells that they are truly loved. This is big news to many cells, because during the critical formative years (the first seven years), we are often programmed to dislike, rather than love ourselves. The biggest life challenge for many of us is to escape the tyranny of those early expectations, to allow us to live our truth and to become who we really are, rather than what others expect us to be. We cannot truly love others until we relearn to love ourselves. The tapping home of this truth appears to encourage our love-starved brain cells to embark upon solving the problem we have highlighted. You can almost imagine those billions of cells saying, "You beauty! I am loved after all – alright let’s fix this problem." It might seem strange, but it works on everything from insomnia and anxiety to phobias and degenerative disease. Check out some YouTube clips on EFT, learn this simple technique and give it a go! What can you lose? The second strategy here involves boring the brain to sleep. Here is how this works. You imagine a teacher standing beside a large blackboard. On the blackboard the teacher draws a big circle, then inside that circle, he/she writes a number, beginning with the number "70". Next the teacher takes a duster and proceeds to slowly and thoroughly erase the number "70". When this task is complete you notice the word "sleep" handwritten in the corner of the blackboard. Take a chalk and slowly trace over the handwriting, also writing the word "sleep" on top of the existing word. It is important to do this slowly and laboriously. When this task is complete, the teacher returns to the large circle on the board and proceeds to write the word "69" within the circle. These letters are then slowly erased by the teacher before you slowly begin writing over the word "sleep" again on the blackboard. This cycle continues with "68", "67", "66", etc, until you get down to zero. This will never happen because you will become so mind-numbingly bored by the time you get down to "50", your brain will give up, finally shut down and you will sleep. That completes the first part of this two-part feature. Next week, I will share four other strategies to help you reclaim your sleep and rescue your life. Sweet dreams.